Recent release “Identically Different,” from Page Publishing author Richard Bernt, is a delightful work that demonstrates to the reader that simply because two people appear different doesn’t mean that they don’t have similarities. In the story, a true effort to find these similarities is made and a lasting bond is formed. 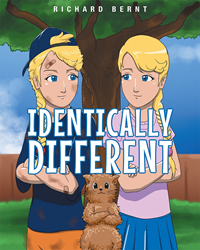 Richard Bernt, a wonderful story teller and avid writer, has completed his new book “Identically Different”: a delightfully entertaining book showing how a set of identical twins that come from what seems two different worlds band together and find common ground and lasting friendship. The author’s first fascination with children's books was spawned during hours spent listening to his wife Julie read to their two children, Wesley and Kelly. The reading mesmerized the children and was something that deepened the family bonds. When their children were grown, the author continued reading to other children by volunteering at both the local elementary schools and libraries. Influenced strongly by Dr. Seuss' rhythmic structuring, his initial children's book carries with it a familiar lullaby flow. The ultimate moral conclusion of “Identically Different” reflects the author's own early struggles with compromise, but ultimate realization for the need to remain flexible to not only the needs of family and friends, but also to society in general. Primrose in the 60s and 70s provided a youthful freedom from external dangers, and like Sal in the book, the only perils were self-created. The constant motion of Sal was also familiar to the author, as was her quest to find an undefined fulfillment and desire to stave off the internal fear of being merely ordinary. Just as in life, the differences between the girls were more perceived than real. When a small painless amount of compromise was offered, the benefits were huge and life was much more enjoyable. This is the author's second book. Published by New York City-based Page Publishing, Richard Bernt’s enjoyable story teaches that instead of avoiding one another for being different or having separate interests, people should get to know each other and find things that are enjoyable to all. On the surface “Identically Different” appears to be a delightful story about identical twin sisters who other than their looks have nothing in common. Kate spends most of her time in the house, is quite proper, prim and prissy. Sally on the other hand is a devil-may-care tomboy who loves everything outdoors. These differences cause them to avoid each other and spend their days apart. When the girls finally start looking for things they both enjoy, common ground is discovered and their basic differences quickly melt away. In the end, the girls discover more than just a lasting friendship. They find that by taking the time to sit down and talk things out, the differences that kept them apart were more imagined than real. Readers who wish to experience this inspiring work can purchase“Identically Different” at bookstores everywhere, or online at the Apple iTunes store, Amazon, Google Play or Barnes and Noble.